Tissue Procurement: Human spine tissue is collected from cadaveric donors with no medical history of spine degeneration or disease within 48 hours of death. Proper consent and serological information is obtained on all specimens. Cryopreservation: Human intervertebral disc tissue is separated into 2 fractions, nucleus pulposus (NP) and annulus fibrosus (AF). A ring of tissue in between the layers is discarded in order to ensure separate pools. 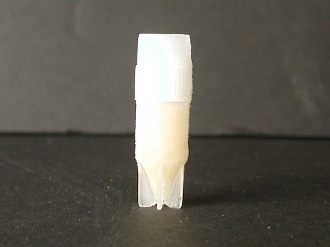 The tissue undergoes enzymatic digestion and the isolated cells are cultured through the first passage. Cells are combined with FBS containing 10% DMSO. Cryopreserved cells are shipped with dry ice for overnight delivery. Guaranteed minimum recovery of 0.5E6 cells after 1 week in culture.